Tom Taylor has accomplished many impressive things with Injustice: Gods Among Us yet I think he may have topped himself with Issue #32. Why? 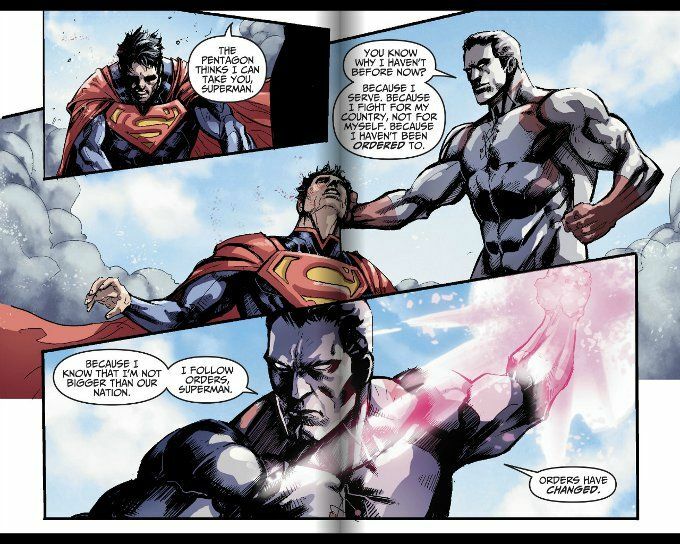 Because he's made Captain Atom into a likeable character without changing the character at all. I normally find the jingoistic heroes who place duty before idealism annoying in the extreme but this issue presents a side of the Captain I don't think any writer has ever captured before. The battle between Superman and Captain Atom outside the Fortress of Solitude takes up the main portion of the issue. The rest involves a subplot that sees the Fortress of Solitude collapsing in on itself and Green Arrow caught on the inside along with Martha and Jonathan Kent. The way Taylor writes both Dinah Lance and Oliver Queen makes me nostalgic for the good old days and I dearly hope he can find some way to bring the two of them together again on Earth 2 when he takes over that title in a few months. Jheremy Rappack's artwork perfectly complements Taylor's story. He does over-indulge on the inks in a few panels, which causes some of the details of his pencils to be lost. Thankfully, these moments are few and far between and this tendency actually proves effective in his depiction of Superman, whose face seems lost in shadow as the character himself is lost to a spiritual darkness. This is a good comic but it is not an ideal jumping-on point for new readers. This should come as no surprise given that this issue is the second chapter of a three-part storyline. Check out last week's issue before getting this one, should you be a newcomer to the wicked world of Injustice.